For one thing, you may want to make sure that files you know have changed are getting backed up, simply for peace of mind. On the other hand, you may feel that Time Machine backups are too large, and you’d like to figure out which files you can Time Machine not to back up. What can you already do? 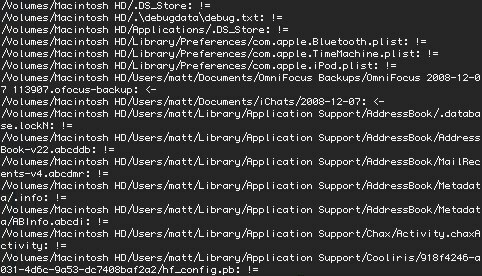 In the Time Machine System Preference, you can see how many megabytes or gigabytes of data are being backed up, and if you open up the Console (/Application/Utilities), you can do a search for “backupd” to see what messages Time Machine is sending to the Console, but that’s it. How, then, does one actually see which files have been backed up? I know of at least two ways to do it. One requires the use of the Terminal, and the other does not. Because the Terminal application is being actively developed, I’m going to begin with it, but if you are not comfortable with the Terminal, you may skip down to the “easy” section (though you might skim the terminal section to have a better understanding of what is happening). First, make sure the tms folder has been unzipped. Open the folder. We only care about the file called “tms” here. In the Finder, navigate to the Go menu, and click Go to Folder… . When the /usr/sbin folder opens, drag the tms file from the tms folder to the /usr/sbin folder. The Finder will tell you that you have to authenticate to add tms to the /usr/bin folder. Choose to authenticate, and type in your administrator name and password. After the file copies, you can close the windows. Now that we’ve moved TMS, you need to open up the Terminal (in /Applications/Utilities), and we’re ready to begin our task. Note: If you back up your computer using a disk that is NOT physically connected to your computer (meaning it’s on a Time Capsule, AirPort disk, or any other disk that turns your backup in to a disk image, you must mount your disk image in the Finder before tms will work. All you need to do is navigate to the backup and double click the disk image. If you have trouble with this, let me know in the comments. 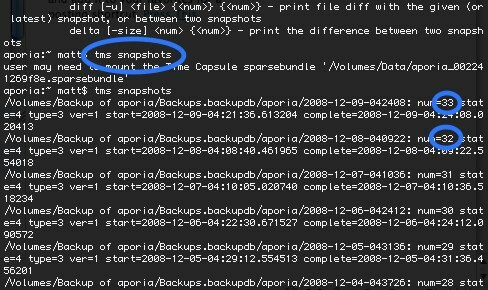 Now, that may look like gibberish to you, but if you look carefully, it is listing each backup made from my computer, which is called “aporia.” A date and time is listed for each. If you notice, I have Time Machine set to backup just once a day at 4 a.m. Thus, the latest backup, number 33, has a time/date stamp of 2008-12-09-042408, meaning Time Machine finished the backup at 4:24 a.m. (and 8 seconds) on Dec. 9. Each of those files listed has changed between the two backups, so in the latest backup, those files were again backed up. Now, my list goes on and on, as I’m sure yours does. If you scroll through it all in the Terminal, you’ll be able to see everything that got backed up. While this isn’t a pretty way of doing things, it works, and it should be good enough to tell you what you want to know. If you’d like to use a program with a graphical user interface, you have one choice: TimeTracker. Now, you may be wondering why I’ve made you read this entire article before getting to the easier (and some may say, better) solution. Basically, TimeTracker is (at this point) a completely unsupported program. The author, Charles Srstka, does not list the application on his website. It has no help and does not even have a custom icon. It’s simply a quick fix. Charles originally posted the link to his application on a MacRumors Forums post, and if you haven’t, by chance, stumbled upon the post, you probably don’t know it’s out there. Please don’t bog down Charles with requests for support. The fact that he wrote this application should be enough for us. To use TimeTracker, the same caveat as above applies: if your backup is on a Time Capsule, AirPort disk, or any other disk where it has been stored on a disk image, you must mount that disk image before opening TimeTracker. What do you think of these solutions? Did they work for you? Is one better than the other? Have you found a better way to view the changed files in Time Machine backups? Let us know in the comments. Growing your social media followers: Why and How?